It was hard, but we found her! She and her shiftless gang of vacationers were spotted crossing the California border, stopping first in her hometown of Sacramento then heading north up to the great city of San Francisco. 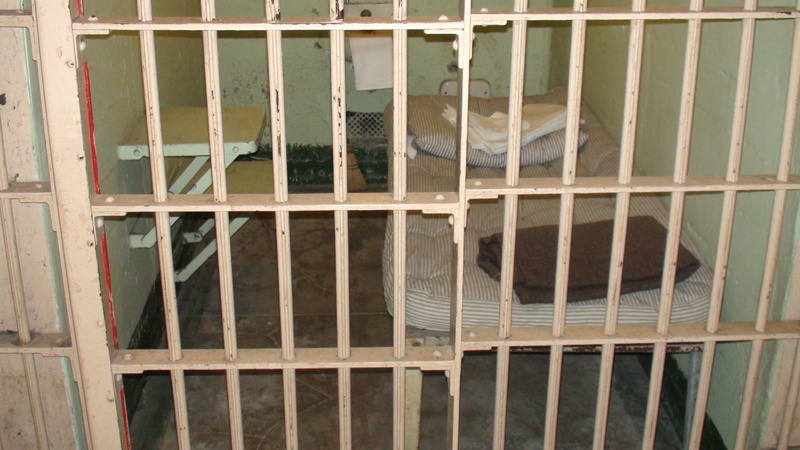 When we were close on her heels (we had leads that she ate at her favorite Vietnamese restaurant Thanh Long then boarded a charter to Alcatraz) she eluded us by fleeing to the small town of Lakeport and hiding on the Pomo Indian Reservation with her husband’s extended family. As the chase heated up we followed her up I-10 North to I-40 East. We could never quite catch up as she sped past the New Mexico, Texas, and Oklahoma borders (apparently the “don’t mess with Texas” signs didn’t scare her one bit). We tried to head her off at a family reunion, but by then she had already ducked out with a larger group to visit the 200 acre farm that’s been in her family since Indian Territory days. We tracked her back to Oklahoma City, keeping our distance while she tried her hand at the shooting range. We were sure we’d nab her after a stint on stage with a live band during an open mic session, but because the place was occupied by mostly family members, her clan made it possible for her to slip away yet again. We were just about ready to give up, especially when we lost sight of her on a middle of the night road trip heading back down I-40 West. 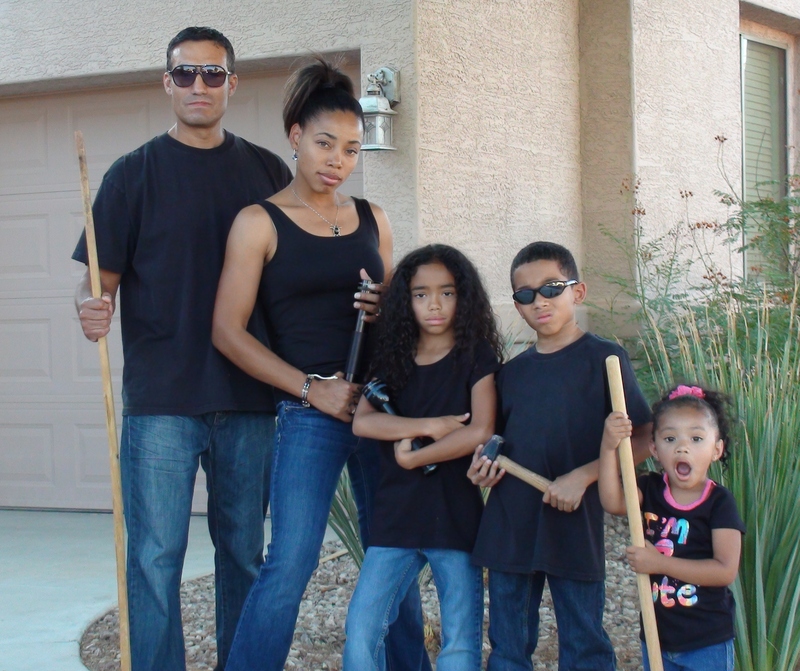 We decided to stop by her house in Arizona to regroup and come up with a new strategy of pursuit. As luck would have it that’s where we found her. She was fishing scorpions out of the pool so she and her band of summer lovers could take a dip. We hid behind the potted herbs (long dead after several weeks of neglect in the merciless desert heat), and nabbed her as soon as she popped out of the water. Sorry it took so long folks. She gave us a run for our money, but we’ve managed to capture your missing writer and put her seat back in its seat. When most people hear the term “Just dropping in,” they think of an unexpected knock at the door by a familiar face. At worst, they’re inconvenienced by the need to go throw on something decent and kick items under the couch. No one associates the phrase with a scorpion landing on your head, then getting a running start to jump off your shoulder and scuttle into the closet before you can even register what’s happening. 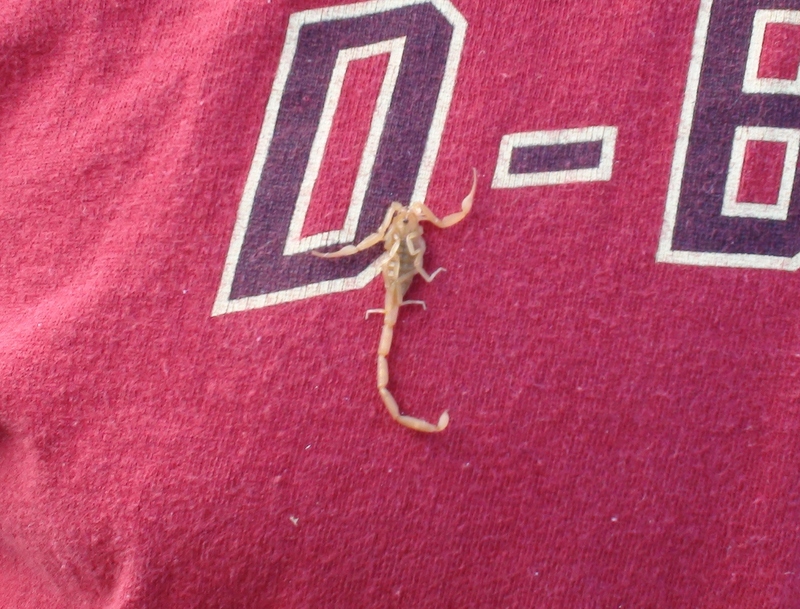 We’d lived in Arizona two years by then and I had never even seen a picture of a scorpion, let alone a real one. Talk about a memorable introduction. I wish I could say my reaction was reasonable. I should be able to say that. A woman who’s driven cross-country alone, single-handedly changed the spark plugs in her first car (a gray Grand-Am named Diane), taken many a charge on the basketball court, and who’s got a battle plan for intruders that could arguably scare your pants off if you knew it – that woman should not be afraid of a bug no larger than her big toe. Nevertheless, that woman (who should be transitioning out of third person by now) had an all-out-fit! Forget that the scorpion was long gone. Once my body registered that it had actually touched me, I couldn’t have stopped the flailing limbs, shrieks, and shoulder jerks if I wanted to. That’s not the worst of it. When my toddler twins came running to see what all the fuss was about, I threw my body sacrificially in front of them as if the whole room were crawling with venomous insects. I know. By the time my kids are all grown and out of the house I’ll have a resume long enough to get me instantly cast as female lead in a drama. Breathing like I’d had a wrestling match with the thing, I finally composed myself enough to pull my phone out of my pocket and text my husband: “There’s a scorpion in the house.” It’s pathetic but I did fully expect him to drop everything at work to come save us. I sooooo was not happy with him at that moment. He of all people should know that his capable wife turns into a useless girly girl when there are bugs involved, though not utterly useless. I went instantly to Plan B. I called our pest control company, put on my sweetest trembly voice, conjured up a plea that would have appealed to the hardest heart (especially the bit about the small, helpless children) and had a technician to our house within fifteen minutes. There’s that acting skill again :-). Turns out scorpions are multi-talented creatures themselves. Though I’d done a quick search and found nothing out of the ordinary but what looked like a tan piece of chewed gum in the closet corner, the technician instantly identified that gum as the scorpion. They’re able to fold themselves up and give off the appearance of a harmless blob. If that doesn’t make your skin itch! The tech left with the blob/scorpion, but not before informing me that it was the most venomous kind in our region – the bark. Very harmful to small children and elderly adults. Oh how wonderful! I got suited and booted as we native Californians call it (geared up for the task at hand) and got busy. Dressed from head to toe in thick clothing (with just the skin on my face exposed underneath my ball cap), I emptied every drawer, went through every pocket, turned out every sock, shook out every toy – you get the picture – looking for any kids, cousins, or extended family members the scorpion may have left behind. I didn’t find any. But something about that first encounter let me know it wouldn’t be my last. And since this is “The Scorpion Chronicles,” it obviously wasn’t. Four years and a refusal-from-my-husband-to-relocate later, you may wonder if my ability to handle these encounters has improved. I’m chuckling just thinking about it. Follow along and you be the judge. This one was fished out of the pool already dead. My husband just couldn’t resist playing with it. 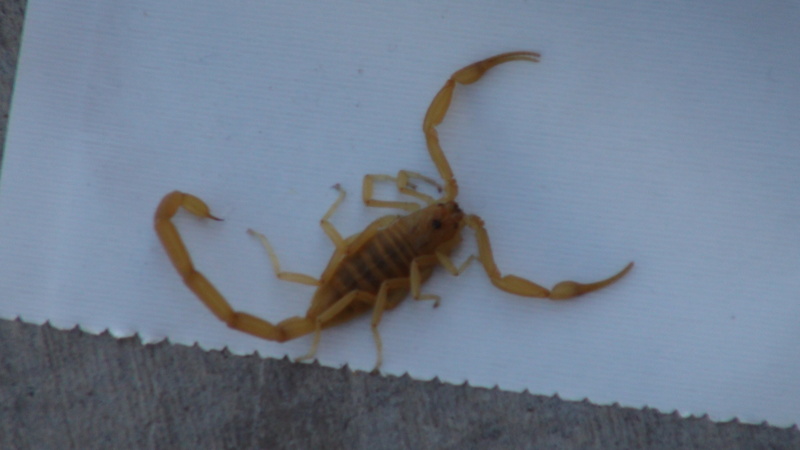 You’re probably asking yourself, “What do scorpions have to do with writing?” And for the most part, the answer is, “Nothing.” However, living in Arizona, these creepy little creatures who serve some God-given purpose beyond my understanding have become a constant presence in my life. And because I have limited control over my house sitting in their desert, I figure the best way to handle the anxiety they give me is to vent about them from time to time. And who knows? Perhaps one day you and I will look out across the blurry horizon while a dry breeze thumps us and the setting sun fights ’til the last to crack our already parched lips; and we’ll see an army of scorpions facing off against some hero (or heroine) in an epic battle to rid one or the other from the world we were able to create through these blog posts. Writing sci-fi/fantasy is not yet my thing. But we’ll see. Angels and chariots, good and evil, throw some Unicorns in there. Hmmmm….Rather random right now but we’ll keep an open mind. In the meantime, I’ll just keep you updated on the day-to-day battle to keep the little suckers outside.